In the final days of the de Valera administration in 1959, a referendum was held on the matter of Ireland's electoral system. Since 1921, Ireland had used Proportional Representation by Single Transferable Vote (PRSTV), which allowed each constituency to return several members and gave smaller parties a better chance of winning representation. The government proposed abolishing this system and replacing it with the First Past the Post (FPTP) system used in the United Kingdom (and, of course, in Ireland until 1921), each constituency would have only one seat, and the candidate who receives the most votes wins. In the UK, FPTP had led to what was essentially a two party system - the Conservatives and the Liberals dominated throughout the 19th century, until the Labour Party displaced the latter in the 20th century. In Ireland, it ensured the dominance of the Irish Independence Party between 1885 and 1918. 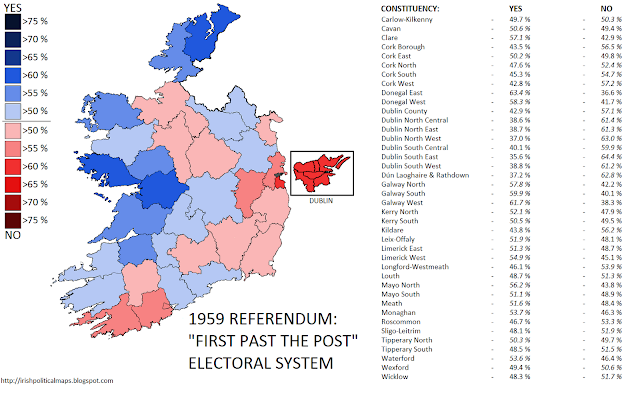 In the Ireland of 1959, where Fianna Fáil were already winning large majorities with PRSTV, a switch to FPTP could have resulted in a nearly indestructable Fianna Fáil majority in every election, pending the party's continued popularity. The proposal was opposed by the other parties, and the result itself was very close. 51.8% voted against the proposal, and the near 50-50 divide was seen in many constituencies across the state. Only in the west did the Yes side win victories of over 55%, while the No side won victories of over 60% in Dublin. The electorate had rejected FPTP, preventing what would have been a fundamental change in the Irish political landscape.